[Top] Fig. 3. Schematic vertical cross-section from the San Fernando Valley (left) north to the epicentral region (right), showing the projected trace of the San Fernando fault and the thrust nature of the fault displacement. 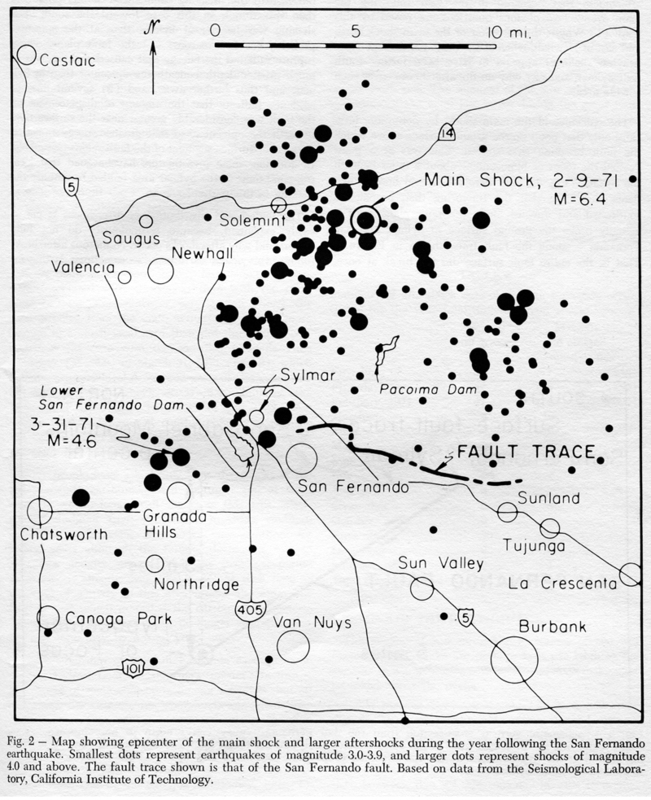 Faulting started at the hypocenter, and the fracture then propagated southward and upward until it broke the surface in the San Fernando-Sylmar area. [Bottom] Table 2. 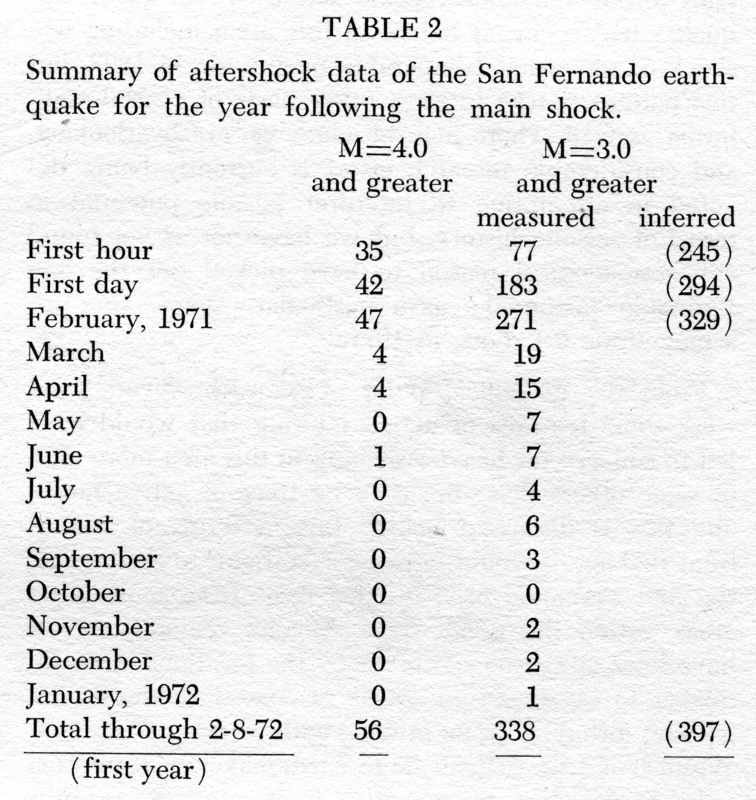 Summary of aftershock data of the San Fernando earthquake for the year following the main shock. Ever wonder why they called it the "Sylmar" or "San Fernando" earthquake if the epicenter was in the Santa Clarita Valley? Because the fault was five miles below the epicenter and it surfaces at Sylmar/San Fernando, so the damage was greater there. Plus, the media started calling it the "Sylmar" earthquake when the Olive View Medical Center went down. Fig. 2. 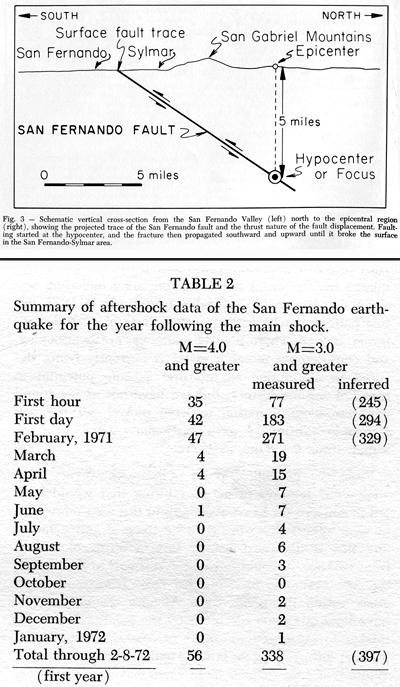 Map showing epicenter of the main shock and larger aftershocks during the year following the San Fernando earthquake. Smallest dots represent earthquakes of magnitude 3.0-3.9, and larger dots represent shocks of magnitude 4.0 and above. 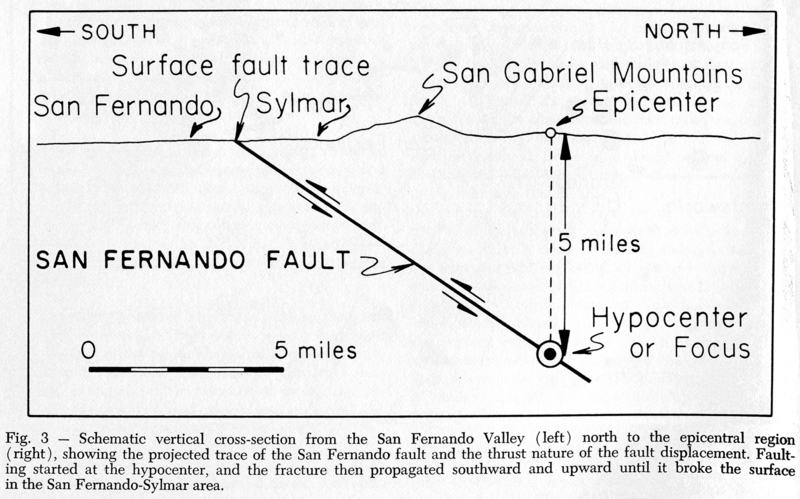 The fault trace shown is that of the San Fernando fault. Based on data from the Seismological Laboratory, California Institute of Technology. White circles appear to represent relative population. Note: The earthquake struck at 6:00:41 a.m., lasted about 60 seconds, killed 65 people (primarily in the San Fernando Valley) and caused more than half a billion dollars in damage to both valleys, including the collapse of the fairly new freeway bridges in the Newhall Pass. The Legislature's report gives a magnitude of 6.4, but it was subsequently assigned a magnitude of 6.6. LW2316c: 9600 dpi jpg from original report, purchased 2013 by Leon Worden.